We all know how much fun it is to believe in Santa Claus, looking forward to his coming to our house and his leaving gifts. But, we also want our children to understand the deeper meaning of the Christmas holiday. In this project we’re hoping to help the children find Jesus, and the Holy Family, in the eyes of Santa. 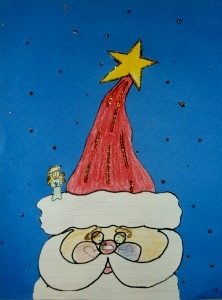 You’ll find this project called, “Finding Christmas,” in the 3rd Grade Projects Gallery in the sidebar. Click on the image to see a larger picture of the project. This entry was posted in 3rd Grade and tagged Christmas, finding christmas, finding christmas in santas eyes, Holy Family, holy family in santas eyes, Jesus, meaning of christmas, santa, santa claus, santas eyes. Bookmark the permalink.